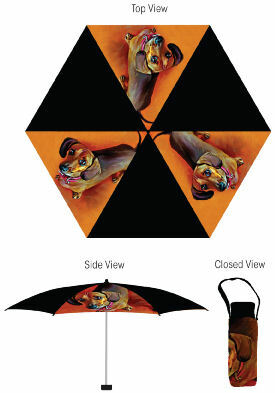 Bright Orange and Black Colors Dachshund Umbrella, featuring an adorable Red Dachshund. Has a Dachshund on the Protective Carry Case, as well. Easy to carry closed size: 2.5 inches wide x 6.5 inches tall x 1.25 inches deep. This Umbrella is So Cute! I get a lot of compliments on it. The colors are as bright at the picture and the quality is great. I Will Be Back Soon to Shop for More Dachshund Gifts! Click the button below to add the Cute Red Doxie on a Orange and Black Dachshund Umbrella to your wish list.